Hawley Bennett-Awad of Langley, BC, is the highest-placed member of the Canadian Olympic Team for Eventing, holding down 31st position following the conclusion of dressage, the first of three phases comprising the Eventing competition at the 2012 Olympic Games in London, GBR. Bennett-Awad, 35, completed the dressage phase on Saturday, July 28, riding Gin & Juice, a 12-year-old American thoroughbred mare she co-owns with Linda Paine, to score 48.70 penalty points. Teammate Rebecca Howard of Salmon Arm, BC, competed on Sunday, July 29, with Riddle Master, and is currently tied for 34th position with a score of 50.60 penalty points following dressage. Jessica Phoenix of Uxbridge, ON, also competed on Sunday, earning a score of 54.80 penalty points to tie for 50th position. Like Howard, Phoenix is also riding a Canadian-bred horse. Exponential is a 14-year-old Canadian thoroughbred gelding owned by Phoenix. “Exponential was incredible!” said Phoenix. “That’s the best he’s ever performed in the ring in his life, and I’m so thankful that he picked this event to do it. 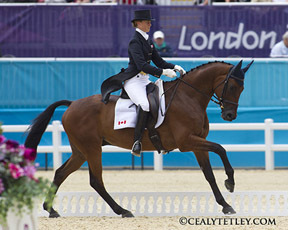 Michele Mueller, 48, of Port Perry, ON, earned a score of 57 penalty points to place 56th following her dressage test riding Amistad, a 13-year-old chestnut thoroughbred/Belgian-cross gelding owned by Julie-Anna Pring. Peter Barry, 56, of Dunham, QC, is currently ranked 67th in the individual standings with 61.70 penalty points riding Kilrodan Abbott, a 13-year-old Irish Sport Horse gelding owned by Peter, Susan and Dylan Barry. Counting the best three scores from the five-member team, the Canadian Olympic Team for Eventing is currently ranked 11th overall with a score of 154.10 penalty points among the 13 nations contesting the team medals. Germany leads the way with 119.10 penalty points, followed by Australia in second with 122.10 and Great Britain in third with 127. Individually, Yoshiaki Oiwa of Japan currently sits at the top of the leader board with 38.10 penalty points riding Noonday de Conde. Italy’s Stefano Brecciaroli is second with 38.50 riding Apollo vd Wendi Kurt Hoeve while two-time Olympic Champion (1984 and 1988) Mark Todd of New Zealand is third after scoring 39.10 penalty points with Campino. With only the first of three phases of Eventing competition completed, the leader board may change following Monday’s cross-country phase. Great Britain’s own Sue Benson has designed a course over Greenwich Park’s hilly terrain that features 28 fences with 39 jumping efforts. Often referred to as the triathlon of horse sports, Eventing is comprised of three consecutive phases. The first phase of Olympic eventing competition, dressage, was held over two days, Saturday, July 28, and Sunday, July 29. The second phase, cross-country, will be held Monday, July 30, while the third and final phase of competition, show jumping, will take place on Tuesday, July 31. Team medals will be decided following the first round of show jumping, while the top 25 athletes in the individual rankings, limited to a maximum of three representatives per nation, will advance to a second round of show jumping to determine the individual medals. The Canadian Olympic Team for Eventing is supported by Coach/International Technical Advisor David O’Connor; Chef d’Equipe Graeme Thom; Veterinarian Christiana Ober; Stable Manager Deb Furnas; Farrier Randy Pawlak; Team Manager Fleur Tipton; and Therapist Jo Ann Wilson. Kerri McGregor is the Team Leader for the Canadian Olympic Team for Equestrian and Tina Collins is Assistant Team Leader. The grooms for the team include Amanda Jones, Dana Cooke, Natalia Gurmankin, Colleen Loach and Meghan Baillie. more information, including results, please visit the equestrian sport section of the official 2012 London Olympic Games website at www.london2012.com/equestrian.